Winter squash keeps so well over the (duh) winter season that I am still using very well preserved squashes that have been mellowing in my (cold) basement since November. I’m astonished at how well they’ve survived, particularly the very large green Hubbard squash that I just roasted. At the cusp of the seasons, the combination of rainy weather and trees dripping pollen has led to nasty head colds and I decided that ginger was the antidote, specifically ginger squash soup. I’m always looking for ways to garnish my soups, sometimes with croutons or herbs, and sometimes with sweet or savory preserves. I had just made an amazing kumquat and mango jam, courtesy of a recipe from Monica Bhide (who graciously acknowledged my post). It seemed just the right combination with the squash and ginger. Delicious. Heat the vegetable oil in a saucepan and add the onion and ginger, cooking it over medium heat until the onion is translucent and the ginger aromatic. Add the squash and liquid, cover the pan and cook over medium heat for 20-25 minutes or until the ingredients are tender. Check periodically and add more water if needed. 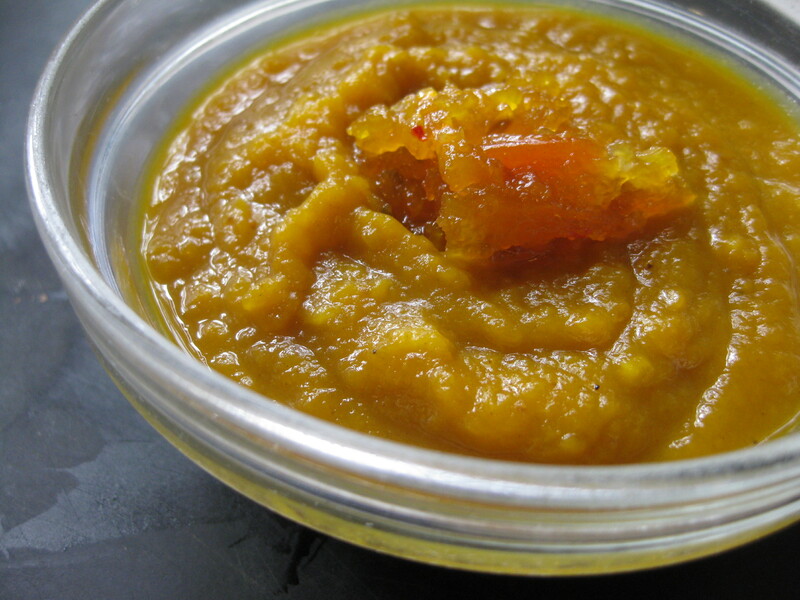 When the squash is completely tender, puree the mixture in a food processor or pass through a food mill. Return to the pan and adjust seasonings (add salt if needed).